­ I have had many inquires on various pieces of artwork on the show so this blog entry is devoted to what we call "wall dressing. " There has been artwork created by our staff scenic artists as well as work I have purchased from individual artists. Unlike procuring art for private clients there are many specific issues I take into account when selecting artwork for the screen. Foremost, it has to be appropriate to the character and the environment. The color palette plays a huge role as well as if the artwork contains patterns or images that will vibrate. I am always thinking of the piece, and how it will look with an actor's head in front of it – don't want it to be a visual that will detract from the scene but as always support the script and entire look of the show. 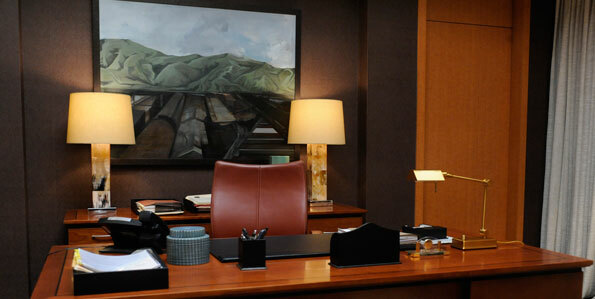 There is a large painting of mountains (I believe) on the wall behind Alicia's desk in her new office. It is so dramatic. Can you tell me who the artist is and also does he or she sell prints of the painting? I have noticed some iconic Chicago images in many of the sets. Interesting way to portray Chicago! Are they all by the same artist? I have seen some in Carey's new office – the corncob towers I think?? Also saw some in Peter Florrick's office. Can you tell me about the artist and or artists? In Alicia's office I got a glimpse of a painting that seems so intriguing. It is a series of stairs and the coloring really struck me. It almost looks like a sunset. Would greatly appreciate knowing who the artist is. Thank you for sharing all of these interesting details about set decoration. There is a large abstract painting at the entrance to Alicia and Eli Gold's new offices. Can you tell me anything about the artist and where they are located? Thank you for taking the time to give so much great information. In Peter Florrick's office there is a photo of the Chicago waterfront that looks fantastic. So curious who the artist is – please advise. "The world around us is a far more uniquely interesting place than most people today seem to credit it. Today, cell phones, the Internet, and hand-held devices are taking the lead in distracting us from what is right before our eyes. In an ever-changing society of fast paced change and rapid desperation for entertainment, one must shed aside the constant subjection to diversions and keenly look around. Sometimes, what you find, be it under a magnifying glass or larger than life, will surprise you in ways that turn the ordinary into the extraordinary."